SQL Server 2016 introduces a new type of table that is designed to keep the full history of data changes, where row validity is managed by the system. This new table type is called a System-Versioned Temporal Table. In earlier SQL Server versions, user tables would enable you to hold only the most recent copy of the row, without being able to query the value before the UPDATE or DELETE operations. 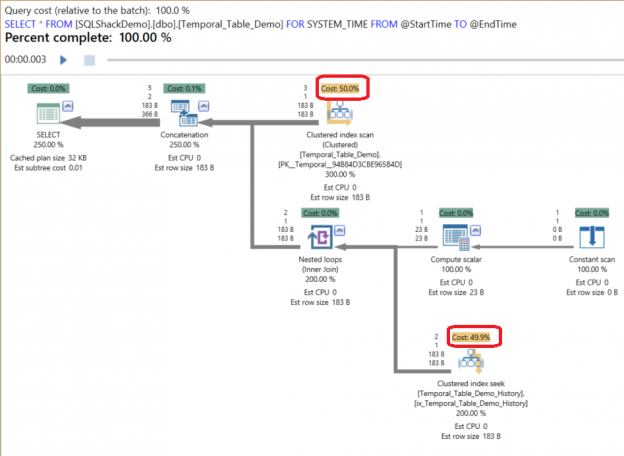 Using a Temporal Table, you will be able to query the recent state of the row as usual, in addition to the ability to query the full history of that row, which is fully managed by the SQL Server Engine, as you can’t define the rows validity period explicitly. Each System-Versioned Temporal Table should contain two datetime period columns that are explicitly defined in the table; the Period Start column that will be used by the system to store the start time of the row, and the Period End column in which the system will store the end time of the row. The main Temporal table will keep only the current version of the table rows, but it will be linked automatically to another table with the same exact schema, in which the previous versions of the modified rows will be stored automatically, this table is called a History table. When you create a Temporal table, the History table will be created automatically. If you don’t specify the history table name as a parameter in the SYSTEM_VERSIONING clause, it will be named with the naming pattern MSSQL_TemporalHistoryFor_<object_id>. Specifying the history table name while creating the Temporal table will allow the system to create the history table with the default system configuration, with the ability to create your own history table and provide its name in the Temporal table creation statement. Take into consideration that no changes can be performed on the history table’s data. If you try to delete any row from the history table, you will get the (Cannot delete rows from a temporal history table ‘<tableName>’) error, as it is only managed by the system. When a new row is inserted, the system will assign the Period Start time column with the current transaction start time-based on the system clock, and assign the Period End time column with the maximum datetime2 value equal to 9999-12-31, and the row will be opened. If an existing row is updated, the system will copy the previous version of the row in the history table and fill the Period End time column with the current transaction start time based on the system clock, and the row will be closed. The Period End time column value of the main temporal table will be 9999-12-31 without any change. Deleting an existing row, the row will be stored in the history table, with the Period End time column value equal to the current transaction start time based on the system clock, and the row will be closed after deleting it from the main temporal table. System-Versioning can be enabled when a table is created using the CREATE TABLE statement or after creating the table using the ALTER DATABASE statement. In order to enable System-Versioning in a table, it must have a primary key, with two not-nullable datetime2 period columns defined as GENERATED ALWAYS AS ROW START or END, passed as parameters in the PERIOD FOR SYSTEM_TIME within the table definition. As we discussed previously, the Period start time will be filled by the system with the transaction start time, and the Period End time will be filled by the system with the maximum datetime2 value keeping the records opened. No changes applied to the history table as no action performed on that rows yet. If you try to query it, you will find it empty. The previous results show us how useful the new System_Versioningfeature is since it allows us to rollback or minimum track the changes applied to that table without getting back to the old backup files for one or few records. A new clause FOR SYSTEM_TIME is added to the SELECT statement to query the data across the history and main temporal tables, with five sub-clauses to provide you with many options to specify the required period of time. The first clause is the AS OF clause, which returns values after performing the union between the temporal and history tables and filtering the rows that are valid at the specified point in time. The row can be considered as valid if the Period Start time value is less than or equal to the specified time and that the Period End time is greater than the specified time. As you can see, the index that we created in the temporal table enhanced the query performance and decreased the execution time considerably. Depending on the workload on your environment, you can customize the best index that fit your queries and enhance your system performance. The System-Versioned Temporal table is a new type of table that is linked with a related history table in order to keep a history for each row change performed on that table. You can develop your own solution depending on the temporal table to track the data changes with the change time and rollback any disaster changes without the need to restore the backup files. You can get information about the temporal tables and the period columns using the existing and the newly introduced SQL Server system objects. The good point here is that it is managed only by the system requiring no effort from your side to define retention periods and follow up the insertion or deletion processes on the historical tables. As any new feature, test it carefully in your test environment before applying it to the live environment.